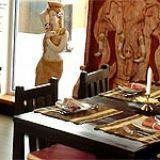 At Kinnaree you will have a unique Thai experience with authentic cuisine and beautiful traditional decor, Kinnaree definitely brings Thailand to Birmingham. Do you work at Kinnaree Thai Restaurant? 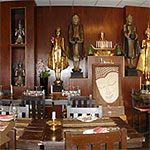 What did you think of Kinnaree Thai Restaurant? I absolutely loved this restaurant. My husband brought me here for our anniversary and it was such a special place and the staff were lovely. This was the worst food that i have had in birmingham with equally poor service. My husband and i went there for dinner the food was cold, when complaining to the waitress she said nothing. we asked for the manager who said the food was fine. We ordered starters and main, never again. This is the first time we have ever left the food uneaten, we were so upset we asked for the bill after waiting and waiting we got up to pay on the way out but no-one acknowledged that we hadn't touched our food or to offer an apology. Kinnaree Thai restaurant is named after the beautiful half-woman, half-swan whose enchanting form is often seen in traditional Thai sculpture and architecture. 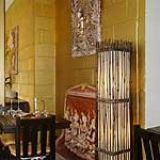 Only the rich experience of dining at Kinnaree allows a full appreciation of how appropriately the grace of that particular being captures the essence of this captivating restaurant. 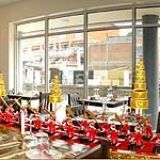 Kinnaree Thai restaurant is situated adjacent to the Mailbox in Birmingham. While the various Mailbox restaurants compete with one another boisterously, Kinnaree, settled a little way apart, is the epitome of elegance and poise. The peaceful Thai music and trickling of the water creates a tranquil and intimate atmosphere. Diners are greeted by the charmingly gentle staff who extend the traditional Thai greeting, or ‘wai’, which involves the hands being placed together under the chin, in a small bow. Most diners will be seated at the tables alongside the restaurant’s glass front, overlooking the canal. Within minutes, however, the view from the window will be forgotten as your gazes are captured by the countless pieces of beautiful Thai sculpture, the grandest of which is the traditional Thai longboat in the centre of the room. The menu itself is a work of art, the pages encased in ornately decorated wood. The extensive range offered by Kinnaree consists of over one hundred dishes, almost half of which make up the vast selection available to vegetarians. The authentic cuisine is meticulously prepared by Kinnaree’s six experienced Thai chefs. Starters are beautifully adorned with intricately carved vegetable garnishes. Both the vegetable tempura (£4.99) and the chicken satay (£5.29) are delicious, but it is the accompanying sauces and dips that steal the show, reducing you to monosyllabic rapture. The duck in the Thai red curry (£7.99) is remarkably succulent and the massamun hed nang fa, a mild vegetable curry from Southern Thailand, balances warmth with a delicious creaminess. The flavours in all Kinnaree dishes should be teased out by the delicate jasmine flavour of the accompanying rice. Whilst Kinnaree does offer a range of wines, beers (Singha beer, £2.95), soft drinks, tea and coffee, the commitment to Thai tradition is consistent and reflected in the wine list. The crisp and refreshing Thai house white wine (£10.95) is a rare treat, and staff are happy to recommend a suitable wine to accompany the intricate blend of flavours in each dish. The only topic of conversation after leaving Kinnaree should be the planning of frequent return visits.